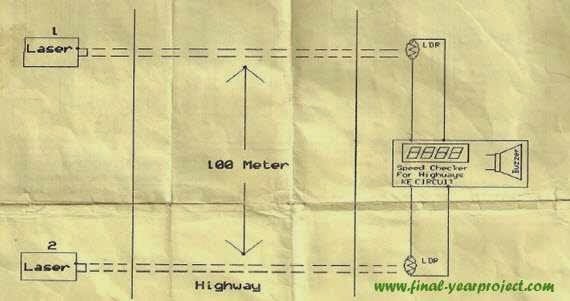 Now days, accident which occur due to over speeding has increase a lot and thus this Electronics project on speed checker for highways is a perfect solution to fine those drivers who drive beyond the speed limit. This report focus on developing a system to control and achieve accurate direction speed for different vehicles with a class of non-linear systems along with obstacles which are present by using wireless communication technique. You can also Subscribe to FINAL YEAR PROJECT'S by Email for more such projects and seminar. In this project, PCB layout is designed without using a micro controller circuit which results in the state trajectory 'sliding' along path-varying slides on the surface. This idealized control law achieves perfect direction & speed however. The method is applied to the control of a two-link manipulator handling variable loads in a flexible manufacturing system environment. In our project we use LDR sensors to detect the presence of a vehicle. 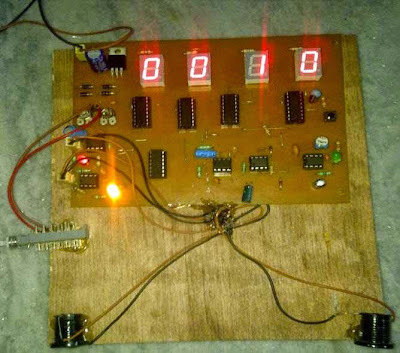 This project contains 2 LDR sensors which are placed apart with a fixed known distance as shown in above image and whenever LDR rays are interrupted by incoming vehicle, the first sensor starts its timer. When the other LDR sensor senses the presence of vehicle, the count up timer is stopped. As the distance and time are received at LDR receiver, the LDR signals is noted and from that we need to calculate speed. Here speed is calculated from the well known formula of speed which is distance/time. In this circuit we are using 7 SEGMENT display for indicating the speed. It is easy to setup and supports the required hardware. To design a vehicle that supports the newest technology available will be more expensive than boards that are already close to obsolete. This project has been designed assuming that the maximum permissible speed for highways is either 40 kmph or 60 kmph as per the traffic rule. The circuit is built around five NE555 timer IC's (IC1 through IC5), four CD4026 counter ICs (IC6 through IC9) and four 7-segment displays (DIS1 through DIS4). IC1 through IC3 function as monostables, with IC1 serving as count-start mono, IC2 as count-stop mono and IC3 as speed-limit detector mono, controlled by IC1 and IC2 outputs. Bistable set-reset IC4 is also controlled by the outputs of IC1 and IC2 and it (IC4), in turn, controls switching on/off of the 100Hz (period = 0.01 second) astable timer IC5. 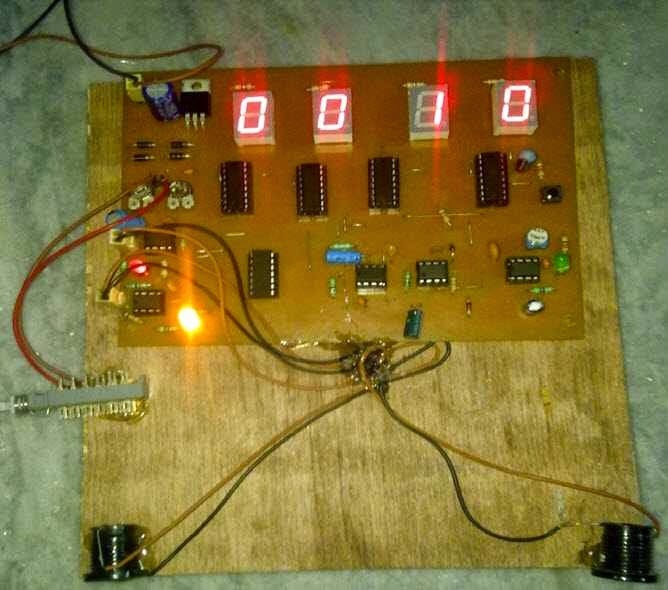 This project is good if you have been asked to make project without micro-controllers and contains all the details like block diagram, circuit diagram, working etc. which is helpful in making project. Use this report for your reference and study work only.